I’ve had Paleo Comfort Foods for a good while, like well over a year. I decided recently to try a few more things. Sometimes I get so caught up in the internet recipes I forget about my cookbooks or tried and true foods. 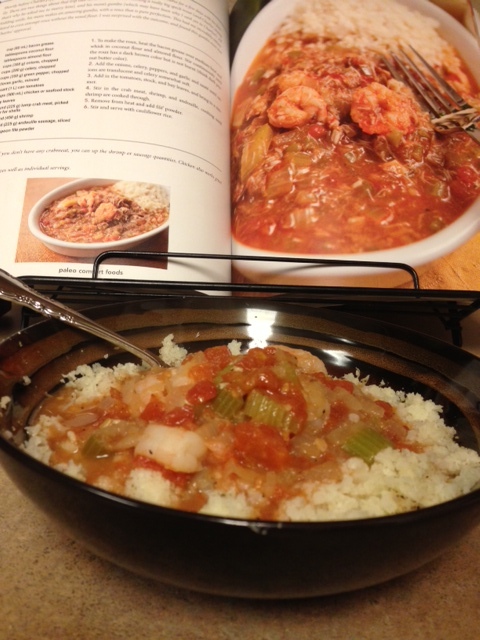 Our latest trial, from a few weeks ago, was Paleo gumbo. I know Dan loves gumbo and we both love cajun food, so it seemed like a good idea. Plus I found shrimp on sale and I already had the sausage, buried in my freezer. I have no idea when I bought that andouille, but when I found it, I knew I had to make gumbo! Roux usually scares me, but it turned out fine. YAY! 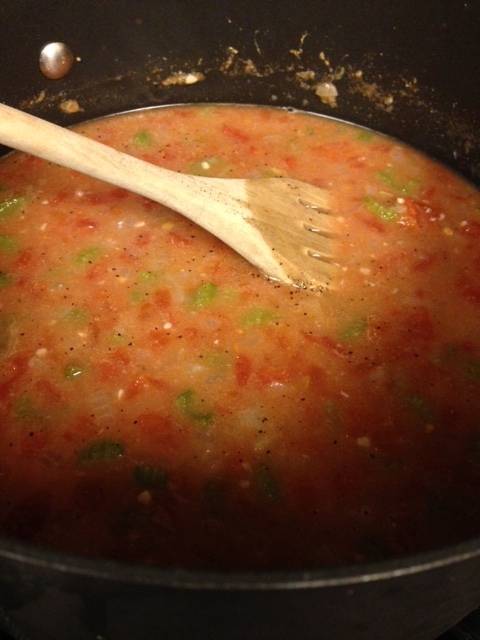 It wasn’t very time consuming just the simmering for a while…. It was good, we both liked it. I served both meals for us with riced cauliflower. In fact, the last time it was on sale, I riced 4 and froze the extras. Sadly, they are all gone now 😦 And the price of cauliflower has gone up quite a bit. I am not sure Dan was wild about the rice, but I was. I have made it cajun, chinese, mexican, stir fried, etc. Good stuff. 1. To make roux, heat bacon grease over medium high heat and whisk in coconut/almond flour. Stir continuously until roux has a dark brown color (think dark peanut butter). 2. 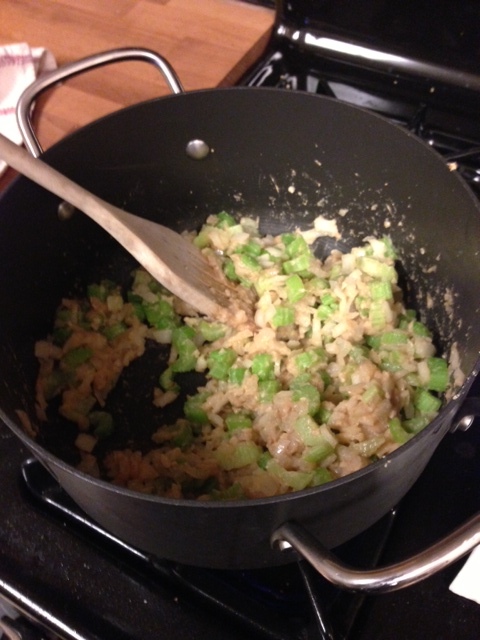 Add onions, celery, peppers and garlic and saute until onions are translucent and celery somewhat soft. 3. Add tomatoes, stock and bay leaves and bring to a simmer. 4. Stir in the crab meat, andouille and shrimp, cooking until shrimp are cooked through. 5. Remove from heat and stir in file powder. 6. Serve with cauliflower rice or all by its lonesome. This was so easy! I actually combined everything and froze it, wrote the directions on the freezer bag. Pulled it out and thawed when I was ready to make. Turned out GREAT! Loved it. Serve with rice and steamed or roasted vegetables. I actually used breasts instead of thighs. Not that I wouldn’t use them, but chicken breasts were on hand. In fact, that’s what I loved, when I put this together, I had everything on hand (and usually do). 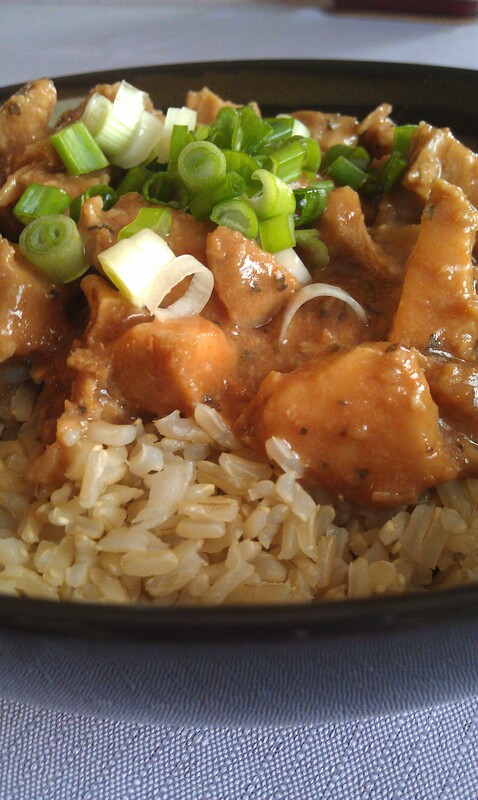 Served over rice, topped with green onions. Mine also had veggies in the bowl, I knew Dan would eat around them, so I didn’t bother adding them to his.